Residential chairlifts offer full access to the levels of your home and can be configured for both indoor and outdoor use. IronHawk Elevator is the highest rated provider of residential elevators and mobility solutions, including the installation of residential chairlifts. Individuals that require the assistance of a wheelchair or other power-driven mobility device, like a scooter, can benefit greatly from installing a residential chairlift. Homeowners can regain the freedom to travel through the entirety of their house, accessing lower and upper levels with ease. IronHawk Elevator can also install these functional and stylish chairlifts on the exterior of your home allowing for increased access and more enjoyment of your property. IronHawk Elevator is proud to be an authorized dealer of Inclinator chairlifts. 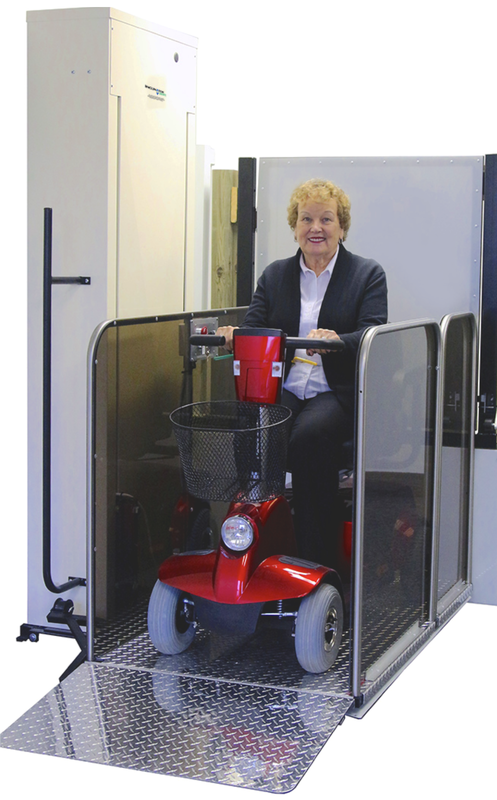 Inclinator offers the highest levels of safety, durability and longevity in the wheelchair lift industry. Chairlifts, or wheelchair lifts, are exposed platforms raised and lowered on a track to allow access between floors and levels of a structure. Typically, the platform has ​enclosing partial walls to ensure the rider’s safety, allowing operation only when the gate it closed and the rider is safely inside. As the name indicates, a chairlift moves both the rider and a wheelchair or scooter between floors. Staircases become a real challenge once an individual requires the assistance of a mobility device. ​When an elevator is not a practical option, a chairlift could accommodate not only those in a wheelchair or scooter, but also residents who need a walker, cane, Segway or any other mobility device. The safety of loved ones is a high priority, especially those with mobility challenges like disabilities or advanced age. This is especially true for the adult children of older parents. Since you cannot be present at all times to assist your loved ones with traveling throughout their home, installing a wheelchair lift could be the perfect solution. A chairlift can restore a level of independence and freedom to those who otherwise could not maneuver around and inside their own home. With installing a residential chairlift, comes peace-of-mind. Each chairlift includes safety features that make it easy and safe to operate. Traveling to and from upper and lower levels becomes easy with a home chairlift, and is safe and convenient for anyone to use. 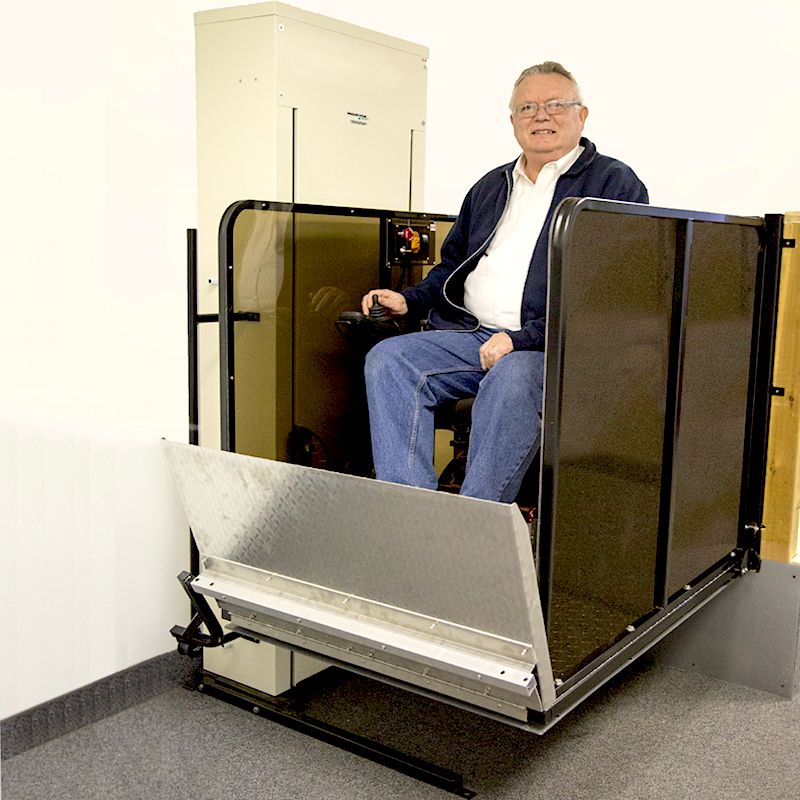 ​Inclinator chairlifts are made with the customer in mind. Easy entry and exit points, nonslip platforms, gates and plexiglass enclosures are just a few of the safety features that protect the unit and user. IronHawk Elevator can install a chairlift that compliments your home’s interior or exterior. For residential interior applications, your chairlift can be customized to fit the décor and function within the space allotted. Vertical chairlifts work well in homes with two or more stories, an elevator may not be the right application but you still need access to those higher levels of your home. Spiral stair cases, multiple levels and other obstacles can be fitted with a specific chairlift to make traveling safe and easy. IronHawk Elevator can also install a quality chairlift on the exterior of your home. Paneling and platforms can be customized to match the exterior or blend in with the surroundings. An exterior chairlift grants the freedom not only to travel in and out of your home, but also the ability to access decks, porches and more, in a simple and safe manner. We also service and modernize existing home chairlifts. Overtime parts will need to be repaired or replaced, so don’t get stuck when you need it the most. We are here to help provide the right residential chairlift solution that best fits your needs. To find out if an Inclinator residential chairlift is the best option for you or someone you love, call IronHawk Elevator for a free consultation. Regain full access to all the floors of your home. Customization options allow us to match your new home chairlift to the existing look and feel of your home's decor. Smooth, quiet and energy efficient operation.